Prove Real Powers by Yourself! Ajarn Mahaburapa (nickname: Ho) is a skilled guru master whom people trust. Mystery of supernatural science inspires him to study magic seriously. Today, AJ Mahaburapa opens his own magical house near Wat Bang Phood Nork, Nonthaburi province. AJ Mahaburapa is very good at white magic. Every day, people such as sellers, government officers, adolescents, etc. come to AJ Mahaburapa for help about good luck, charm, love, etc. AJ Mahaburapa can do ‘Long Lak Na Thong’ for people. This ceremony, AJ Mahaburapa pastes a gold leaf on person’s face and spells Katha. It is believed that whoever passes ‘Long Lak Na Thong’ will be charismatic and prosperous. Objectives: This collection, AJ Mahaburapa would like people to worship in order to take proceeds to restore the temple Wat Bang Phood Nork, Nonthaburi province. Ceremony: AJ Mahaburapa fully consecrated this collection by himself. Note: The real amulets may be different from the pictures. They are in a good condition from guru master. Special Service: We are glad to provide our Luangpu customers Katha for the amulets in text and MP3 and how to worship. PetPaYaTorn is name of person half human and half angel. They are handsome and beautiful forever. They are also charming and real lovers. They have a lot of magic. They live and play musical instruments in Himmavanta (a legendary forest which surrounds the base of Mount Meru in Hindu mythology). PetPaYaTorn Amulet is regarded as a powerful and effective amulet in charm that can make the owner attractive and able to draw good feelings from people. **So, if you want people to pay attention to you and want to succeed in love with somebody who you are having a crush on, don’t miss this absolutely. AJ Mahaburapa is a skillful guru master who is ready to use magical competence to help people. Features: There are images of beliefs: Garuda, Chinese symbol, Chinese lion and sacred characters on the medal. **Power: This medal is good to be with you to prevent bad luck and to get through a new year fluently. This is the image from imagination of real lady spirit named Sirinat. People around Wat Bang Phood Nork, Nonthaburi province call this spirit Mae Sirinat (Mae means mother or polite word to call a lady). Agate is a hard stone with bands of different colors. It is beautiful and useful. In the past, Egyptians believed agate could bring wealth and charge physical energy. Today, people believe agate can make us feel good and healthy especially for people who have allergies. This stone is like an eye of tiger believed as a third eye of future. Tiger Eye is believed to help you make a good decision and inspire you new things. Also, it can prevent black magic and reduce stress. 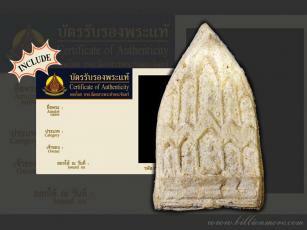 **This one was blessed by LP Kalong 15 years ago (in 2001 C.E.). Now, AJ Mahaburapa, a skilled master has brought it to earn donations forWat Bang Phood Nork, Nonthaburi province. Year: LP Kalong blessed in 2544 B.E. (2001 C.E.). Power: Naturally, boa likes to wait for his prey rather than go out to hunt. When prey comes, boa mightily catches and eats it easily. So, amulet made of parts of boa especially its skin and spur is believed to attract good luck and wealth. Moreover, boa is a symbol of plenty, so amulet from boa can bring exuberance to people who own. Besides, in Thai belief, snake involves love. When man or woman dreams of a snake, they will find their soul mates. So, amulet from snake especially a big snake will have strong power of charm, attracting people. **Power: Mae Takien will bring good luck, wealth and fulfillment as the worshiper prays to her. “Mae Takien” is what we call the lady spirit who lives in Takien tree. It is a long time that some Thai rely on Mae Takien especially praying to spiritual help. Most Takien trees are usually tied with 3 colors pieces of cloth: red, green and yellow (sometimes pink, blue and yellow) and placed with offerings by prayers principally a classic Thai lady dress which will be popularly offered by people who accomplished their wishes with Mae Takien. "I am doing ok. Thank you for LP Nong picture. He is a special Guru. I appreciate it."